A little bit about me - I am Kate, recently turned 40. Partner to Andy and mum and step-mum to six children ranging from one to twenty-one years old. I have recently decided to have a career change and I have returned to college to become a counsellor. I would say that I am a stay at home mum when not studying but I really don't like that term and its implications. I also do not like to say that I am a non-working mother – what mother doesn't work? I also do not like the term full-time mother as it implies that those who are in paid employment only mother part time. We are all juggling school runs, busy diaries and bedtime chaos. So rather tongue-in-cheek I prefer the title "Household CEO". My journey started about ten months ago. I was exhausted from months of sleep deprivation. Amelie, our youngest daughter, (then 8 months old) had not slept for more than two hours since birth. I wanted to lose my baby weight but as I was lacking in energy, still breastfeeding and the last thing I wanted to do was to go on a diet. It was a photo of me running the junior parkrun with Sophie (5) that prompted me to do something about my weight. I joined Slimming World. I was rather sceptical as to whether it would work for me but I couldn't have been more wrong. Slimming World's healthy eating plan was easy to follow, generous and flexible. Moreover, the plan caters for the breastfeeding mum. With the determination to adapt to different eating habits and increase my physical activity I lost just over two stone in three months and I have continued to maintain my new weight for seven months. I did not foresee at the time how a dramatic weight loss would have such a dramatic impact on my physical and mental wellbeing, but it has. In a nutshell, my weight loss journey has been the catalyst for increasing my physical activity. Losing weight gave me the confidence to run. Ten months ago (in the dreaded photo) I struggled to jog the 2k junior parkrun with my girls. Tomorrow I plan to leave the house at 7.30am to run 10k before joining them for the parkrun. I'd have laughed if someone would have said then, in a years' time you will be signed up to do a half marathon (although part of me laughs nervously now when I think about it!). I initially increased my activity through power walking with the pram. I started by doing Fitbit challenges with one of my closest friends. If there was an opportunity to walk instead of drive, I took it. Poppy (7) and Sophie's school then did a programme supported by sustrans to see who could walk/cycle/scoot to school (one way) instead of driving for two weeks. We did the challenge and have power walked and scooted to school ever since. Apart from the obvious benefits of walking to school – increased physical activity for all, better for the environment etc – the biggest benefit for me is that our girls now talk to me on the school run. While Poppy is scooting alongside me, I hear how she wants to be a school librarian and we think about what she can include in her audition letter. I hear how Sophie has been chosen to be in a gymnastics competition. I also hear Amelie saying "quack, quack" in her pram as she sees a bird fly by and the girls laughing. Walking is definitely a much more social affair. I then took the leap from power walking to running. I started by doing the junior parkrun with Poppy and Sophie to running alone. Last May I ran 2.7 miles at a pace of 11.28. Since then I have run over 200 miles and I recently completed a 10k run in under an hour. I run in the rain, cold and after sleepless nights from looking after poorly children. I am not a natural runner. When I run, I can't talk, I hurt, I swear and I cry sometimes. I definitely wouldn't call myself a serious runner or an athlete (as Strava describes me). My preparation before my 10k run (aside from running obviously) consisted of Poppy and Sophie making me good luck bracelets, painting my nails purple to match my trainers and putting a bottle of prosecco in the fridge for after my run. So why do I run? Running is my headspace. Mums brains are often like internet browsers with too many tabs open – we all need headspace (as well as a sense of humour and gin). Although running is my headspace, I fit running around my family. I do the school run, then take Amelie to the park to feed the ducks and then buggy run home. I run with Andy while he pushes Amelie, I do the junior parkrun with Poppy and Sophie and the adult parkrun. 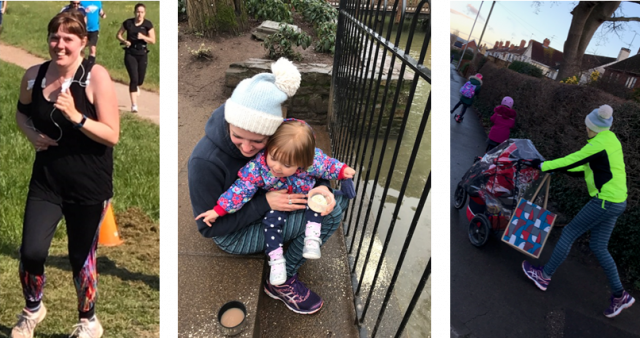 I am no longer scared to be last at the parkrun (not that any anyone is last – there is always the tail walker) and I am no longer scared of the dreaded photos on Facebook. I felt this way because of my lack of confidence, not because Parkrun is exclusively for the superfit athlete. Far from it - Parkrun is an inclusive family community for all abilities. We have even encouraged Phoebe (19) to take part in her local parkrun while at university with her friends. Thank you for taking the time to read my journey so far. I am living proof that small changes can make a massive difference to your physical and mental wellbeing. All a girl needs is the support of her family and friends and the belief that she can do it. As Poppy said to me "if you believe you can do it Mummy then you can" and I did #ThisGirlCan. Have you been inspired by Kate's story? Click here to see what activity is happening near you.